We set out to educate the public about the rise of antibiotic resistance and the large applicability of home diagnostic devices. To this end, we participated in fairs, youth educational meet-ups and universities open-days. In order to measure the awareness about synthetic biology and the level of comfort towards performing self-diagnosis, we conducted a survey for students and the general public. We also interviewed experts to gather educated opinions on the concerns surrounding synthetic biology and genetically modified organisms, as well as paper-based diagnostic devices and their distribution in areas with limited access to medical stations. We have raised awareness on the issue of antibiotic resistance and familiarized hundreds of people to the possibility to utilize user-friendly paper-based diagnostics, which rely on synthetic biological circuits. 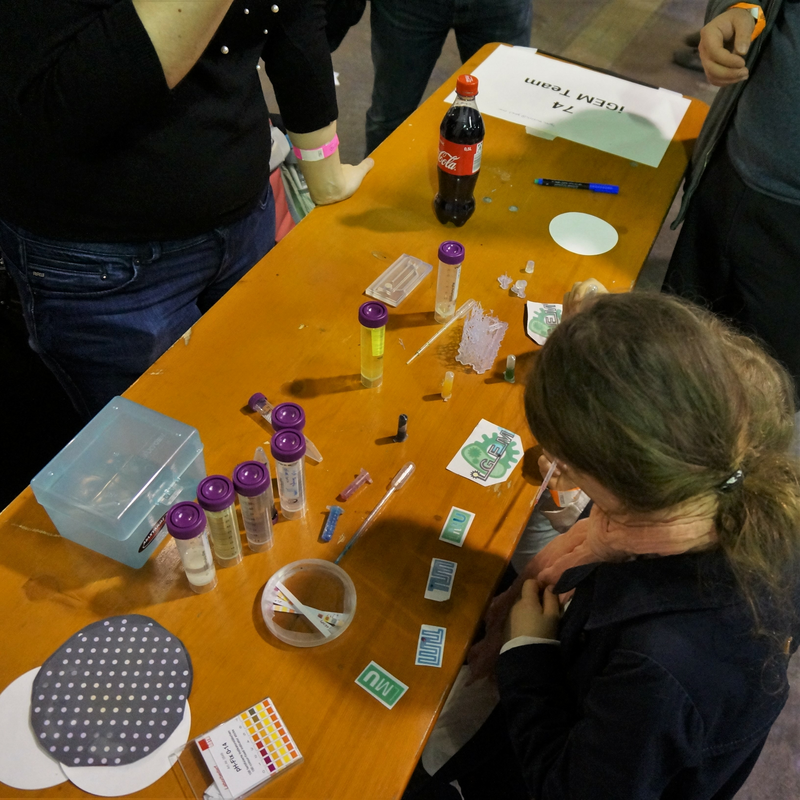 To get the opinion of the public about synthetic biology and diagnostic devices we attended several events around Munich during the last months. To most of our presentations we brought printed paperfluidics with us to let everyone experiment with simple detection systems, so they had an idea on how our device would work. Our toy model for detection of infectious diseases was color-based pH detection on paper. Kids were especially fond on these. We created two types of paperfluidics based on wax printing. In one, the idea was to create a flow channel by printing maze-like designs with wax on the Whatman filter paper (GE Healthcare), so that the colored fluid could only flow through the guided channels. 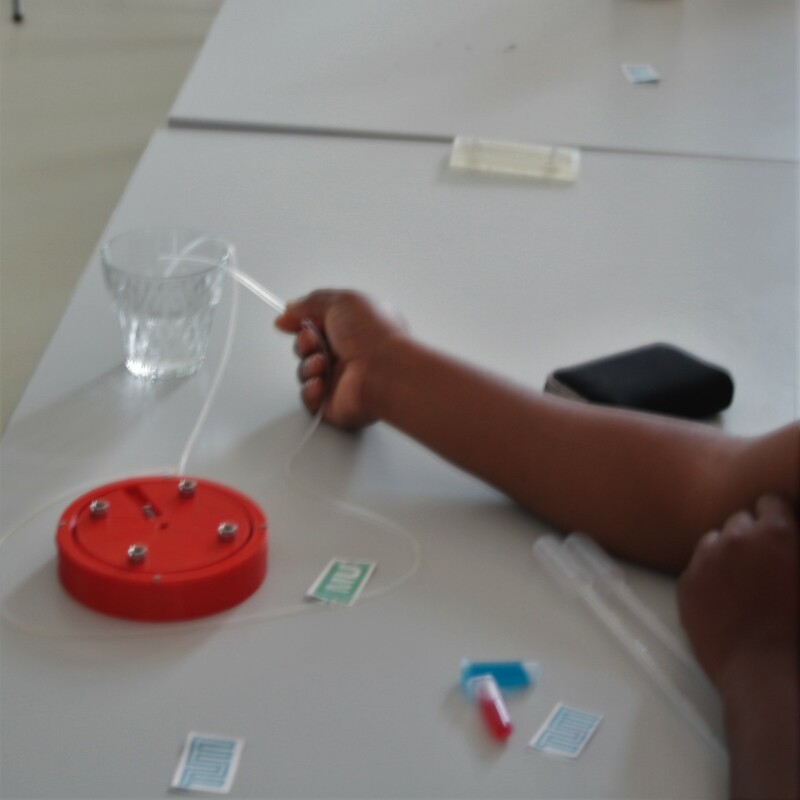 In the other one, we used cabbage to create our own pH paperstrips and show people how colored readouts work on diagnostic devices. We boiled the cabbage in water and then submerged the filter paper in it. The paper was then dried and we printed a pattern using wax. 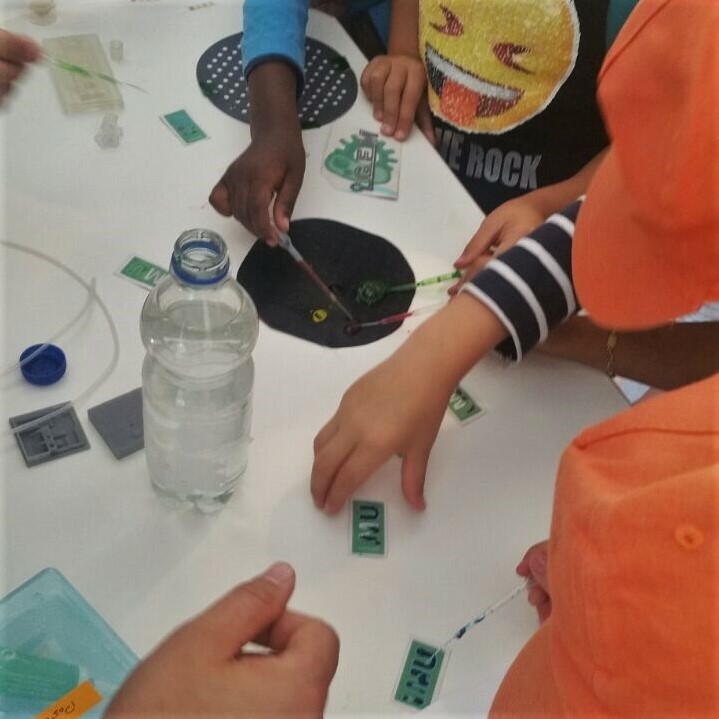 Children were invited to test the pH of different solutions in it. One of the first events we went to was Make Munich, a maker and DIY festival, where we had a stand and showed people our project via a poster presentation. We met both people with and without a scientific background, and we talked about the future applications of synthetic biology and the iGEM competition. We listened to their experiences with medical care and antibiotic treatment, and we highlighted the growing problem of antibiotic resistance. 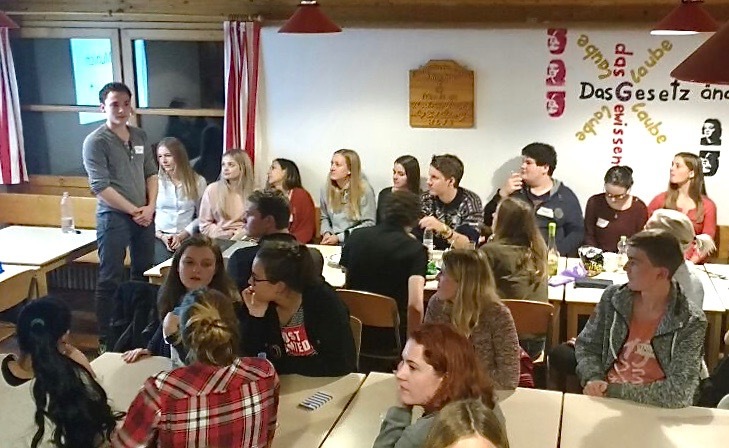 We then attended the KLJB youth meetup, which is a 3-days camping program with different workshops, presentations, and activities for young students from schools and universities in Munich. We spoke with many students, especially from high school, about synthetic biology and home diagnostic devices. Both were unknown topics for them, so they were very curious to learn more about it. We also presented CascAID at the Open House Day of the LMU Biocenter,where we met people from different ages who were very curious about science and the research done at the LMU. 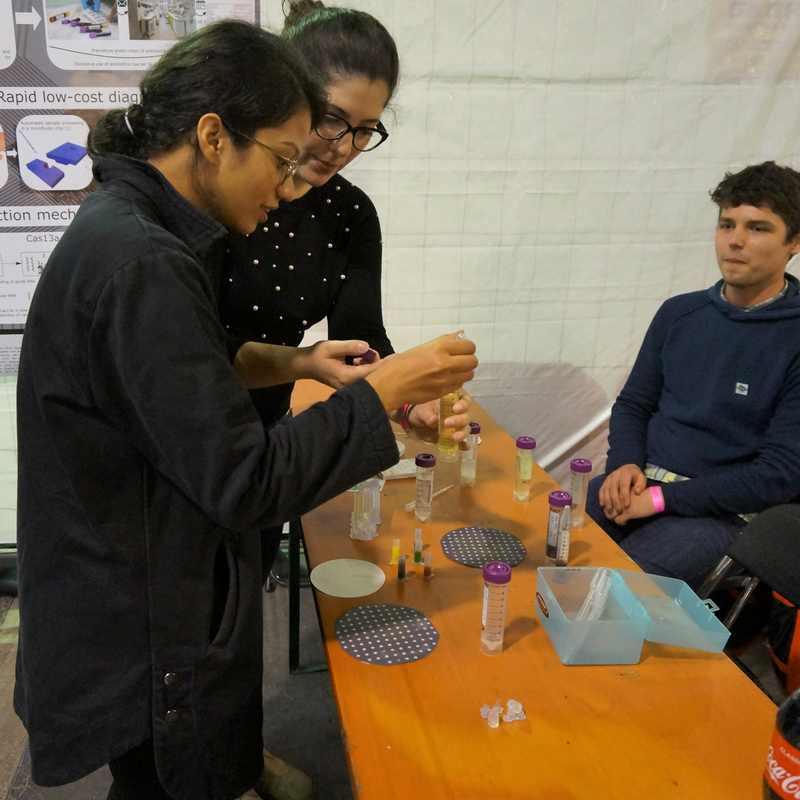 Many students showed interest in joining iGEM and working on synthetic biology. 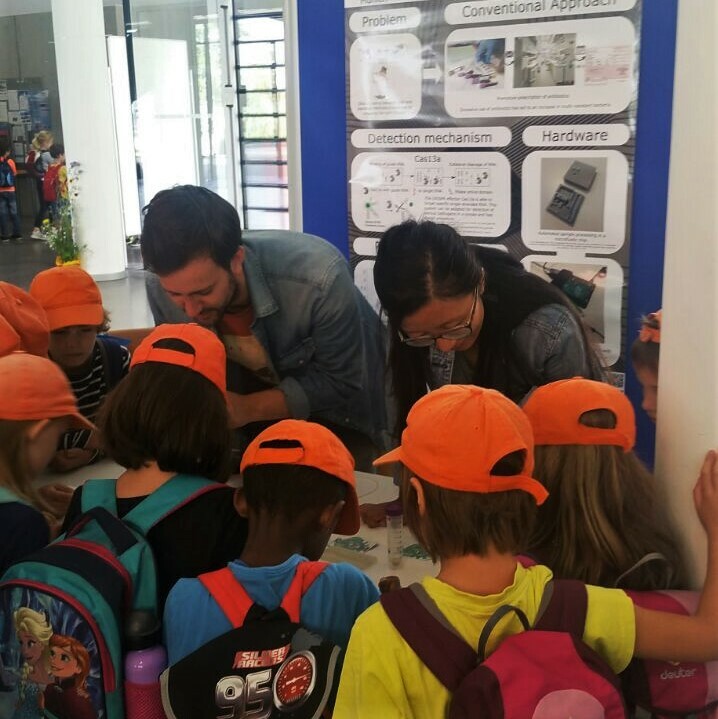 We also received many children who were amazed playing with our paperfluidics and the 3D-printed parts from our hardware prototype. We used this opportunity to explain them in a simple manner how paper could be used to detect diseases and speed up recovery. 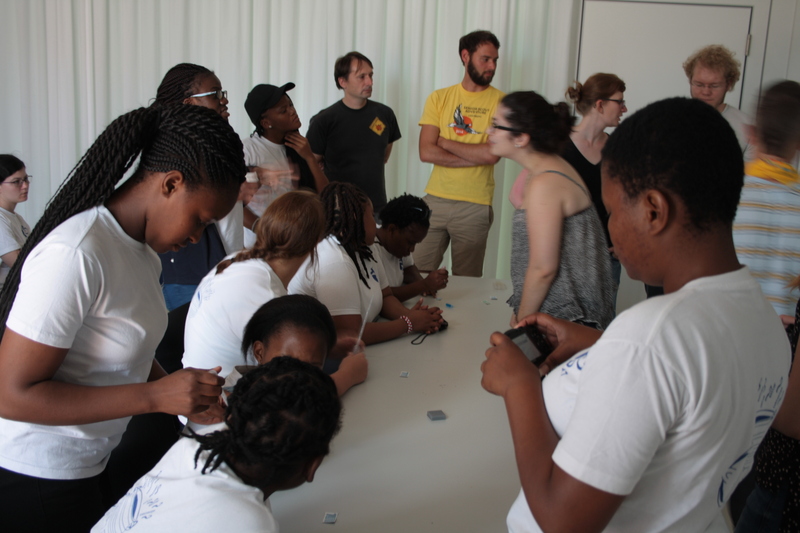 A group of high school students from Girl Guides South Africa came to visit us at our lab to learn more about synthetic biology. We were surprised by how curious they were about our project and the future applications of this field. We cleared the doubts they had on antibiotic resistance and emphasized the importance of limiting antibiotics use. They also asked us a lot of questions about our motivation for working on science and our future careers. We also met some of the Amgen Scholars that the LMU was hosting this year. We did a presentation about iGEM, synthetic biology applications, and our project, and distributed flyers with key information regarding these topics. They were very interested about the competition and the fact that students could develop a project on their own. Since these students had a biological background, we explained them our project in a detailed manner and discussed about causes behind resistant bacterial strains. We went to the streets of Munich to distribute our survey, introduce people to the synthetic biology field and again raise awareness on the antibiotic resistance problem. We met people from different ages and background, and even a couple from Boston that knew about iGEM! We were surprised on how fond people were on using home diagnostic devices and explained them how our device could help reduce antibiotics overprescription. At the Nanoday fair hosted by NIM we met very motivated students and scientists, but also people with no relation to science. We talked with them about iGEM, synthetic biology, and home diagnostic devices. 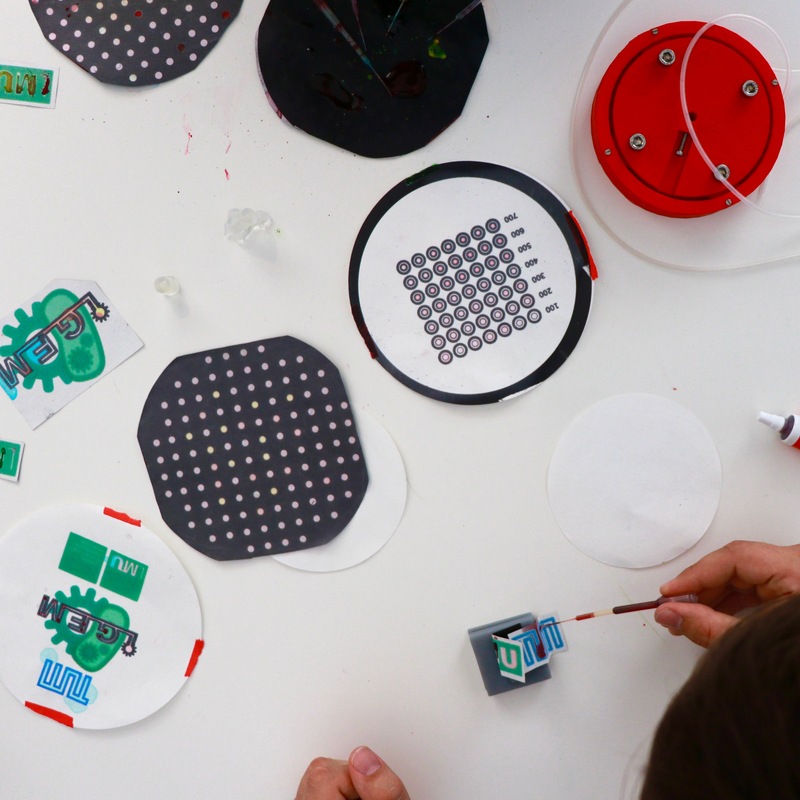 As in our previous events, we brought our paperfluidics and hardware parts, so people could get a better grasp of our project. In October, we did two educational presentations within the frame of the Welcome Program Day to the new TUM and LMU Bachelor students of Molecular Biotechnology and Biology. 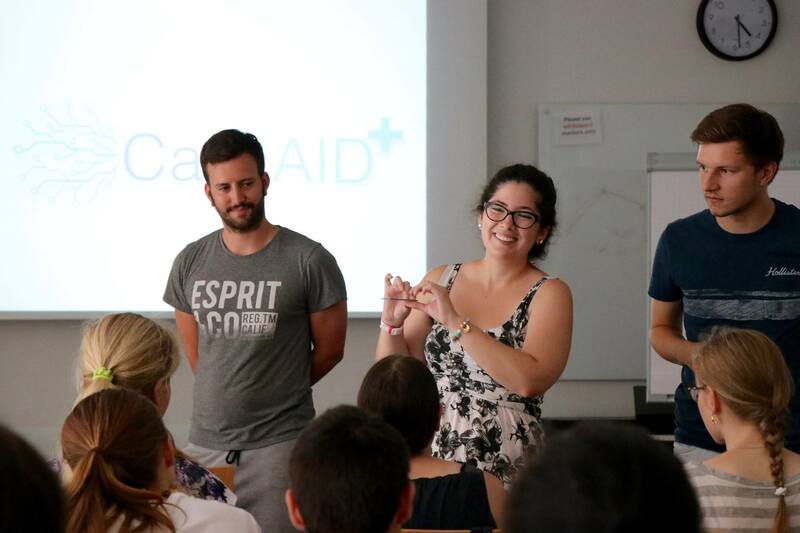 We talked about iGEM, CascAID, and how we used synthetic biology to develop a novel point-of-care diagnostic device. 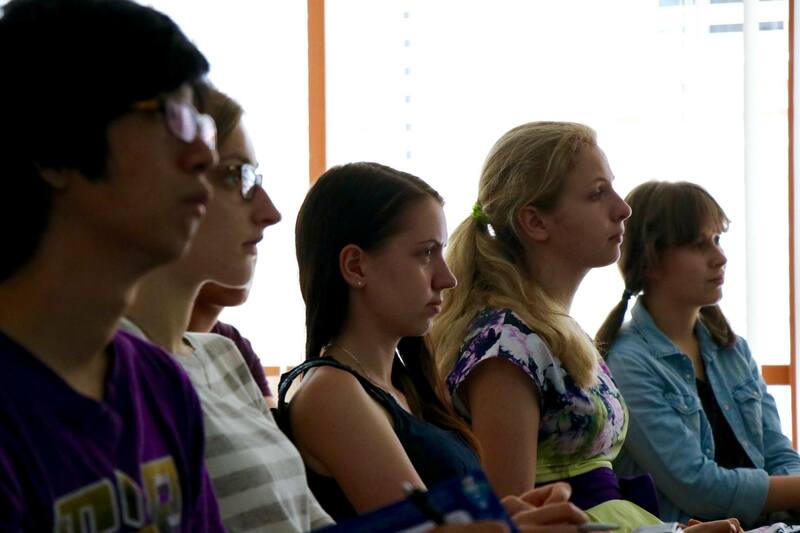 We reached over 200 students, which at the end were very motivated and eager to join iGEM in the next years. With all these events, our main goal was to make people more familiar with synthetic biology and reduce the worries they have when it comes to emerging new technologies. We are glad we helped raise awareness on the antibiotic overprescription and misuse problem, and we hope that we motivated both children and high school students to follow a career in science. We had the opportunity to interview several experts working in the field of diagnostics and synthetic biology. We had the pleasure to talk with Dr. Keith Pardee, Dr. Sabine Dittrich, Prof. Joyce Tait, Dr. Roberto De La Tour, and representatives from GE Healthcare. Dr. Pardee stressed the importance of actively communicating with the public, so they can know about our work and the benefits that synthetic biology could bring to the world. This would decrease the worries on the use of new technologies within society. We also received important feedback regarding our project and point-of-care diagnostic devices. We conducted a survey on synthetic biology and diagnostics devices to find out how the public would react to our project. 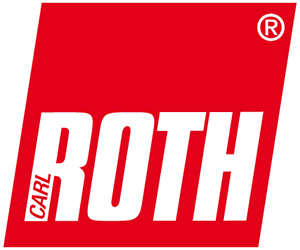 We targeted different groups: Munich students and general public without a biological background. A part of the survey was conducted in the online platform Survey Monkey and the other part was done at the Munich city center where we distributed survey handouts. We hoped this survey would help us improve our project by understanding the public interest and doubts about diagnostic devices. We analyzed the survey data and interpreted the results. Question 1: Do you know about synthetic biology? 53% of the students in the Munich area knew about synthetic biology but only 13.8% of the general public have heard about this field. Question 2: Do you know about the iGEM competition? From the surveyed students, 30% have heard of iGEM before, but only 5.2% of the general public knew about it. This is not surprising considering the previous results, that not so many people are acquainted with the synthetic biology field. Question 3: Do you know about the CRISPR/Cas system? Although the CRISPR/Cas system has been hyped by both the media and scientists as one of the most important technologies because of its genome editing applications, less than half of the students and 12% of the public knew about it. Question 4: Do you trust in home diagnostic devices like home pregnancy tests? 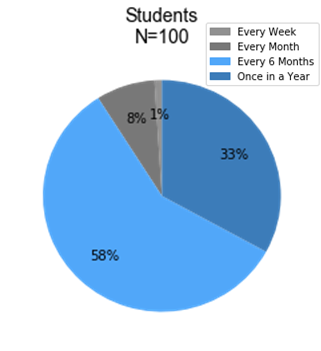 Surprisingly, more than half of the students and public trust home-based diagnostic devices. This could mean that our device might be well accepted by the public. Question 5: Would you use diagnostic devices at home to determine pathogenic diseases? Only 25% of students compared to 86% of the public would use home diagnostic devices to know whether they have a pathogenic disease. The public´s answer corresponds to the result in the previous question on whether they trust this type of devices. 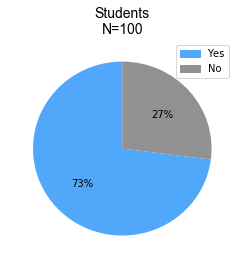 However, although the majority of students trust home diagnostic devices like pregnancy tests, 75% of them would not use a similar device to detect a pathogenic disease. Question 6: How often do you visit a doctor? 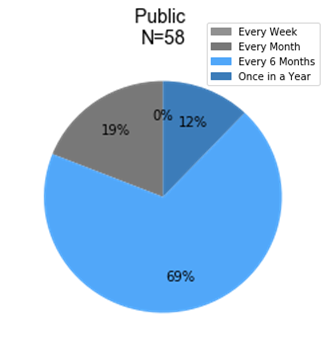 Most of the students and general public consulted go to the doctor every 6 months. Question 7: Do you need to make an appointment when you go to see a doctor? Most of the people need to first get an appointment in order to visit their doctors. Our device could be used as a first test for people to decide how urgently they need to see a doctor. Question 8: How long do you have to wait for an appointment with a doctor? 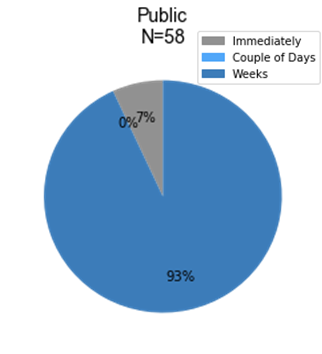 The time that people need to wait for an appointment varies between days and weeks. This could make a difference in the treatment needed if an infection is diagnosed too late. Our device has the potential to be used as an early diagnostic so that the patient can get medical attention faster if needed. Question 9: Would you use a diagnostic device at home instead of going to the doctor? 55% of the students and 86.2% of the general public would prefer to use a diagnostic device at home than going directly to the doctor. When we interviewed them, we stressed the importance of going to the doctor afterwards in order to get a professional opinion. Question 10: Would you be comfortable to use a home diagnostic device for viral and bacterial infections? 70% of the students and 84.5% of the general public said that they would be comfortable when using a device to diagnose a viral or bacterial infection. This could mean that our device might be well received by the public. Even though synthetic biology is considered a growing research field, not so many people are acquainted with it. Despite iGEM attracting hundreds of teams every year all over the world, the public seems to be not very well informed yet. Regarding the use of home-based diagnostic devices, people were very eager to use them and would trust their results. Most of the people would prefer to use a test-at-home instead of going directly to the doctor, probably due to the long waiting time to get an appointment. However, we noticed some discrepancies when asking the students whether they would use this type of devices. When we asked about their opinion about the use of such devices for pathogenic diseases, only 25% said they would. However, when we asked them if they would use a diagnostic device at home for discerning between a bacterial or viral infection, 70% answered favorably. This might be caused by a bias in the words we used to describe the questions. From this survey we learned that our product will be positively accepted by the consumers, even for diagnosing viral or bacterial infections. Our device could be useful to get a first diagnosis before getting proper medical attention, in order to speed up the recovery and save time.